CBI - China: Day 35 of 41 of the 1st Battle of Shanghai, Manchuria. 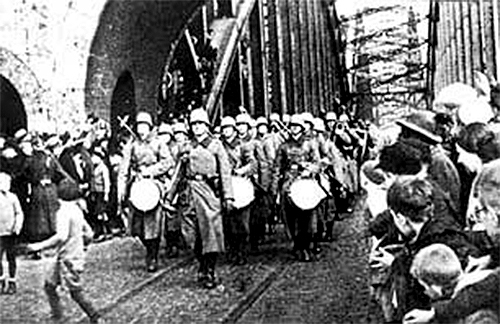 The Chinese 19th Route Army indicates they are running out of supplies and are preparing to withdraw from Shanghai. CBI - China: Day 61 of 142 of the 1st Battle of Hebei. The Chinese counter attack against the Japanese 4th Cavalry Brigade initially achieves some success, but is beaten by superior firepower. Germany: Hitler violates the Treaty of Versailles by reoccupying the demilitarized zone in the Rhineland as part of a diplomatic test of will. He issues final orders for German troops that if French forces should take action, his troops are to withdraw. At this point the German Army was not very strong and could have been rather easily defeated, but the position of both the French and the British was that they will do anything to avoid war. By doing nothing, however, the seeds for war are planted and take root. Spain: Day 229 of 985 of the Spanish Civil War. Spain: Day 594 of 985 of the Spanish Civil War. USSR: Russia's third major Great Purge trial begins. This will end with the execution of 18 conspirators including Alexis Rykoff, former Soviet Premier. CBI - China: Day 239 of 2,987 of the 2nd Sino-Japanese War. Day 24 of 124 of the Battle of Henan. Vatican City: Eugenio Pacelli becomes the head of the Catholic Church, taking on the papal name Pope Pius XII. Spain: Day 959 of 985 of the Spanish Civil War. CBI - China: Day 604 of 2,987 of the 2nd Sino-Japanese War. Atlantic: British India liner SS DOMALA is bombed in the English Channel, killing 100 people. Atlantic: UK cruiser HMS BERWICK stops German steamer WOLFSBURG, which was disguised as a Norwegian ship, north of Iceland. The crew is rescued by the BERWICK, who sinks the ship before departing. Atlantic: British cruiser HMS DUNEDIN stops German steamer HEIDELBERG 60 miles west of Aruba in the Caribbean Sea. The HEIDELBERG is scuttled by her crew, who are picked up by the DUNEDIN. ETO: The UK and France make another request to Sweden and Norway to allow passage of Allied troops through their borders in order to aid Finland. Germany: US Under Secretary of State Sumner Welles meets with Hitler in Berlin. Finland: Day 94 of 105 of the Russo-Finnish War. Hungarian volunteers reach Finland after 3 weeks of travel and immediately begin training with the Finnish Army. The Soviets attempt to establish a beachhead west of Viipuri, Finland (Baltic Sea), across the frozen Viipuri Bay, which fails. CBI - China: Day 970 of 2,987 of the 2nd Sino-Japanese War. Day 109 of 381 of the Battle of South Guangxi. Day 35 of 67 of the Battle of Wuyuan. Atlantic: German U-boats attack an Allied convoy northwest of Outer Hebrides, Scotland, sinking three ships. ETO - UK: Day 178 of 258 of the Blitz. The RAF launches a heavy raid against Cologne, France. MTO - Bulgaria: The German 12th Army moves into Bulgaria. Great Britain breaks off their diplomatic relations with Bulgaria. MTO - Libya: At Kufra, Free French Major Philippe Leclerc pledges not to lay down his weapons until the French flag once again flies over the cathedral at Strasbourg, France. East Africa: Day 266 of 537 of Italy's East African campaign in the lands south of Egypt. British 11th African Division begins marching from Mogadishu, Italian Somaliland, toward Jijiga, Abyssinia, in pursuit of the retreating Italian troops. East Africa - Eritrea: Day 26 of 56 of the Battle of Keren. CBI - China: Day 1,335 of 2,987 of the 2nd Sino-Japanese War. CBI - Thailand: Day 153 of 221 of the Franco-Thai War (Vichy France vs Thailand). 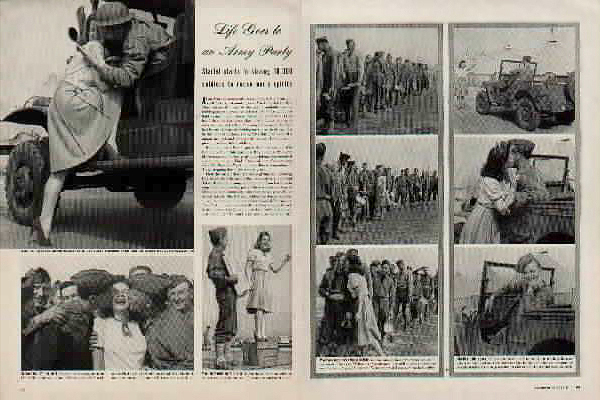 USA: Life magazine runs a photo spread of actress Marilyn Hare and her USO morale-raising mission to kiss 10,000 GIs. She falls short, however, managing to kiss only 733 before her lips give out. 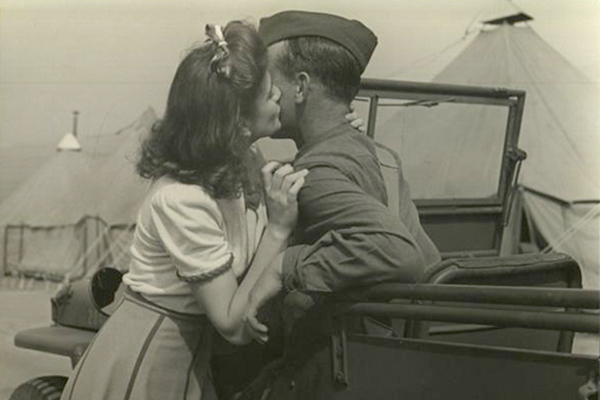 Her USO morale-raising mission to kiss 10,000 GI fell short, however, managing to kiss only 733 before her lips give out. Publicity stunts like this were very common on America's home front. Everyone lent whatever talents they had to the war effort. 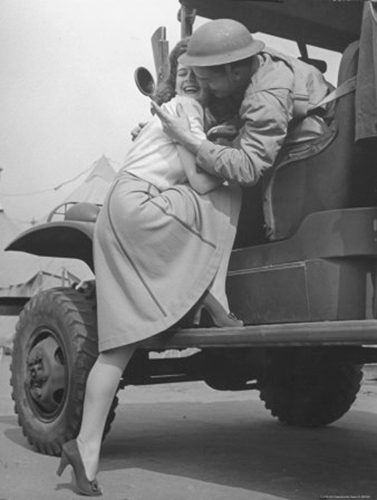 The photos make it obvious that the kisses Marilyn Hare both distributed and received were of the G-rated, on the cheek variety, not that any of the soldiers objected. Some soldiers, it seems, wanted a little more than their fair share. 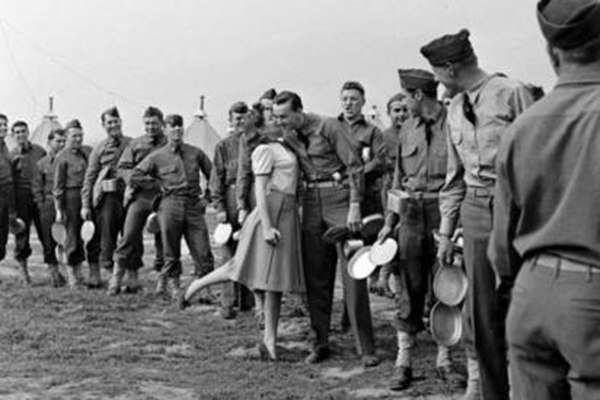 USA: The first Stage Door Canteen opens in New York City, offering servicemen nights of dancing, entertainment, food and nonalcoholic drinks, and even opportunities to rub shoulders with celebrities — all for free. 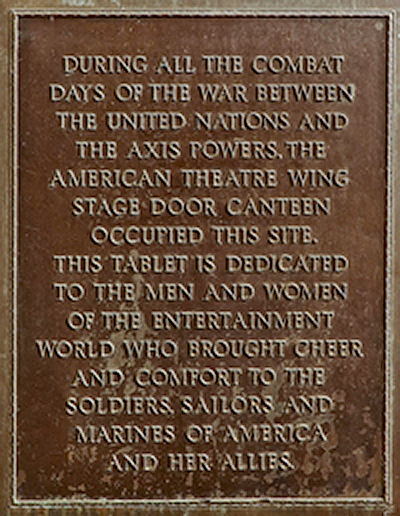 The Stage Door Canteen was started and directed by The American Theatre Wing, War Service Inc, at the beginning of WWII. 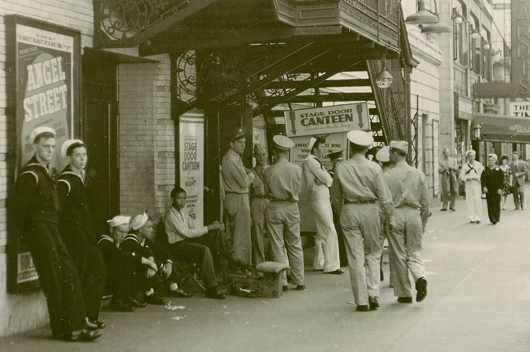 The first Stage Door Canteen was located in the basement of the 44th Street Theater; it measured 40 by 80 feet and could accommodate 500 people at a time. On its opening night entertainers included a comedian, a ballet dancer, and actors Gertrude Lawrence, Tallulah Bankhead, and Walter Pidgeon. A reporter from the New York Times wrote of "a conga line, which trailed all over the place." It was a success and seven nights a week the building pulsed with hordes of servicemen and young women dancing to the sounds of the most famous bands in the country. Stars abounded. Actress Helen Hayes served sandwiches while actors Alfred Lunt and Sam Jaffe cleared away the plates. Stage Door Canteens were later located in Boston, Washington DC, Philadelphia, Cleveland, San Francisco and Newark. Towards the end of the war there were Canteens in London and liberated Paris. Young women were recruited to work as hostesses. Their uniform was normally a red, white and blue apron to be worn over an appropriate dress. The Canteens were all closed at the war's end. USA: Lieutenant General John L DeWitt issues Public Proclamation No 1, declaring that "such person or classes of persons as the situation may require" will be subject to exclusion from, essentially, the entire Pacific coast to about 100 miles inland. 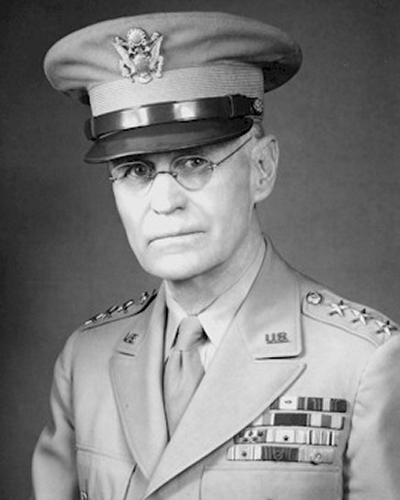 General DeWitt believed that Japanese and Japanese-Americans in California, Oregon and Washington were conspiring to sabotage the American war effort, and recommended they be removed from coastal areas. President Roosevelt agreed with DeWitt's recommendation and, on 19 Feb 42, issued Executive Order 9066, which paved the way for the internment of 110,000 Japanese men, women and children. In the course of carrying out the policy, he issued military proclamations that applied to American men, women and children of Japanese ancestry, most of whom were American citizens, directing that they be moved from their homes to government created and operated relocation camps. Anyone who had "enemy" ancestry was required to file a Change of Residence Notice if they planned to move. A second exclusion zone would be designated several months later, which would include the areas chosen by most of the Japanese-Americans who had managed to leave the first zone. Atlantic: Day 48 of 169 of Germany's Second "Happy Time," during which U-boats sink 609 Allied ships with little risk. Churchill declares that the German battleship TIRPITZ is "the most important naval vessel in the situation today" and believes her destruction would "profoundly affect the course of the war." A German U-boat shells the American island of Mona near Puerto Rico, causing little damage. ETO - France: RAF bombs the Renault plant in Billancourt near Paris while the Lancaster bomber makes its debut laying mines in the harbor at Brest. ETO - France: Official German figures are announced in Vichy of over 5,000 arrests and more than 250 executions in 1941. Russian Front - North: Day 176 of 872 of the Siege of Leningrad. Russian Front - North: Day 23 of 102 of the Battle of the Demyansk Pocket, another failed attempt to break the siege at Leningrad. Russian Front - North: Day 39 of 103 of the Battle of the Kholm Pocket. Another attempt to break the siege at Leningrad. Russian Front - Center: Day 54 of 103 of the Battle of Vyazma, Russia. Russian Front - Center: Day 54 of 103 of the Battle of Sychevsk, Russia. Russian Front - South: Day 124 of 248 of the Siege of Sevastopol, Crimean Peninsula. All German attacks against Sevastopol are shut down for the winter. CBI - Burma: Day 79 of 164 of Japan's Invasion of Burma. General Wavell reassumes post as Commander-in-Chief in India and Burma. Burma is now cut off from the Southwest Pacific. CBI - China: Day 1,700 of 2,987 of the 2nd Sino-Japanese War. Day 69 of 99 of the 3rd Battle of Changsha. CBI - Java: Day 3 of 13 of the Battle of Java. Japanese troops are within 20 miles of Jogjakarta, the last airfield in Allied hands. US 5th Air Force B-17s and LB-30s evacuate the last remaining 260 men from the airfield. CBI - Java: Submarine USS PERCH surfaces at 0200 hours, only to be forced to dive again by Japanese destroyers. Her leaking oil makes the Japanese believe she has already broken up, so they leave the area. While being repaired, she is discovered by two Japanese cruisers and three destroyers. The sub is sunk and the crew become POWs. PTO: The Dutch take supreme command of all Allied forces in the Southwest Pacific. PTO - Australia: Australia declares war on Thailand. PTO - Borneo: Day 77 of 107 of the Battle of Borneo. PTO - Hawaii: Two Japanese flying boats attack Hawaii but miss their intended targets in Pearl Harbor. PTO - Malaya: Day 12 of 357 of the Battle of Timor Island, a long guerrilla war ending in Japanese victory. PTO - Philippines: Day 85 of 152 of the 1st Battle of the Philippines. 5th Air Force provides air support. Germany: Goebbels' diary notes that "we are now definitely pushing the Jews out of Berlin" and expresses that "many Jews are still in hiding and need to be found and deported." The Auschwitz Concentration Camp is informed that 15,000 Berlin Jews are being transported into the camp and they must be kept in good health so that they can work at the camp. Russian Front - North: Day 541 of 872 of the Siege of Leningrad. Russian Front - North: Day 21 of 51 of the USSR's Operation POLAR STAR, a failed offensive north of Leningrad, hoping to take the southern shore of Lake Ladoga, Russia. Russian Front - North: Day 302 of 658 of the Siege of the Kholm Pocket, USSR lays siege to the Kholm Pocket but the Germans hold out for a about a year and a half. Russian Front - Center: Day 1 of 30 of the 3rd Battle of Rzhev-Sychevka, Russia. Russian Front - South: Day 12 of 25 of the 3rd Battle of Kharkov, Ukraine. The Soviet 3rd Tank Army is destroyed near Kharkov which had just been recaptured by the Soviets two weeks prior. MTO - Tunisia: Day 106 of 178 of the Battle of Tunisia. RAF and US Air Forces provide Allied air support. German troops begin withdrawing while attacking along the Mateur-Taberka road. MTO - Italy: US 12th Air Force B-17s bomb shipping and the harbor area at Palermo, Sicily. CBI - Burma: Day 72 of 104 of the 1st Battle of Arakan. US 10th Air Force provides air support. The British Chindits march 20 miles up along a road northeast of Pinlebu. CBI - Burma: Day 23 of 79 of the Allied Operation LONGCLOTH. CBI - China: Day 2,065 of 2,987 of the 2nd Sino-Japanese War. PTO - Alaska: Day 269 of 435 of the Battle of Kiska, Aleutian Islands. PTO - New Guinea: Day 1 of 3 of the Naval Battle of the Bismarck Sea. ETO - Germany: US 8th Air Force B-17s and B-24s attack targets in Germany. ETO - France: US 9th Air Force B-26s attack NOBALL (V-weapon) targets at Tergnier, Amiens/Glisy and Rosieres-en-Santerre Airfields in the morning and again in the afternoon. German Luftwaffe ace Egon Mayer (102 victories) is killed as his FW-190 aircraft is attacked by a pair of P-47 Thunderbolts near Sedan. Germany: 421 Czech prisoners are transferred from Auschwitz Concentration Camp to Buchenwald Concentration Camp. Russian Front - North: Day 30 of 191 of the Battle of the Narva Isthmus, Estonia. Both German and Soviet troops in the Baltic region go on the defensive. Russian Front - South: Day 70 of 113 of the USSR's Dnieper-Carpathian Offensive in southwestern Ukraine. MTO - Italy: Day 46 of 123 of the Battle of Monte Cassino. RAF and US Air Forces provides air support for the Allied ground troops. MTO - Italy: Day 41 of 136 of the Battle of Anzio. RAF and US Air Forces provides air support for the Allied ground troops. CBI - Burma: Day 64 of 99 of the 2nd Battle of Arakan. CBI - China: Day 2,431 of 2,987 of the 2nd Sino-Japanese War. PTO: US 7th and 13th Air Forces attack targets in the Marshall and Caroline Islands. PTO - New Guinea: Day 3 of 80 of the Battle of the Admiralty Islands. 5th Air Force provides air support. US 1st Cavalry Division captures Hayne Airfield on Los Negros Island in the Admiralty Islands. PTO - New Guinea: Day 166 of 219 of the Battle of Shaggy Ridge. US 13th Air Force provides air support. PTO - New Guinea: Day 79 of 597 of the Battle of New Britain. US 10th Air Force provides air support. PTO - Solomon Islands: Day 123 of 295 of the Battle of the Bougainville Islands. US 13th Air Force provides air support. ETO - France: Day 214 of 284 of the Battle of Brittany. ETO - France: Day 169 of 236 of the Siege of Dunkirk. ETO: Day 42 of 66 of the Battle to the Rhine. Armored spearheads of the US 9th Army reach the Rhine near Neuss while the US 3rd Army captures Trier on the Moselle River. US 9th Air Force provides air support. ETO - Netherlands: Allied troops liberate Roermond and Venlo. ETO - Germany: Day 11 of 36 consecutive RAF night raids on Berlin. The RAF also makes a heavy attack on Mannheim, causing a devastating firestorm and conducts its last major raid on Cologne. ETO - Germany: US 8th Air Force B-24s and B-17s attack synthetic oil plants and a tank factory in Germany. Russian Front - Finland: Day 169 of 223 of the Lapland War. Finland and Russia have joined forces to kick the Germans out of Finland's most northern province. Russian Front - Center: Day 139 of 206 of the Battle of the Courland Pocket in Latvia. The 2nd Belorussian captures Neustettin. Russian Front - Center: Day 37 of 75 of the Battle of Königsberg, East Prussia (now Kaliningrad, Russia). Russian Front - Center: Day 36 of 63 of the Battle of the Heiligenbeil Pocket in East Prussia. Russian Front - Center: Day 21 of 54 of the Battle of East Pomerania, Germany. 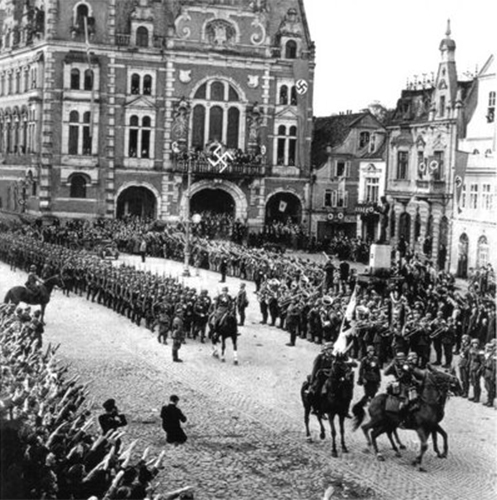 Russian Front - Center: Day 18 of 83 of the German Siege of Breslau (today Wroclaw, Poland). Russian Front - Center: Day 30 of 31 of the Battle of Schwedt, Germany. MTO - Austria: US 15th Air Force B-24s and B-17s bomb at Linz, Sankt Polten, Amstetten, Graz and Knittelfeld. CBI: US 20th Air Force B-29s attack the naval base in Singapore. CBI - Burma: Day 43 of 61 of the Battles of Meiktila and Mandalay. The US 10th Air Force provides air support. At Kamye, UK Corporal Gian Singh takes out a series of foxholes and an anti-tank gun with a Thompson submachine gun and grenades despite serious wounds. He is awarded the Victoria Cross. CBI - Burma: Day 27 of 99 of the Battle of Pakokku and Irrawaddy River operations in central Burma. The US 10th Air Force provides air support. UK Corporal Fazal Din is attacked by six sword wielding Japanese and is run through the chest by one of them. Din wrestles the sword away, killing him and another man, earning him the Victoria Cross. CBI - China: Day 2,796 of 2,987 of the 2nd Sino-Japanese War. PTO - Japan: Day 12 of 36 of the Battle of Iwo Jima. US 7th Air Force provides air support. PTO - New Guinea: Day 431 of 597 of the Battle of New Britain. US 10th Air Force provides air support. PTO - New Guinea: Day 315 of 481 of the Battle of Western New Guinea. US 10th Air Force provides air support. PTO - Philippines: Day 134 of 299 of the 2nd Battle of the Philippines, aka the Liberation of the Philippines or the Philippines Campaign. PTO - Philippines: Day 78 of 244 of the Battle of Luzon. 5th Air Force provides air support. US airborne troops have recaptured Corregidor. PTO - Philippines: Day 28 of 29 of the Battle of Manila.